It’s simple – performance is tied to hydration. Replenish your body with bioavailable electrolytes to enhance fluid absorption, ensuring you are ready to perform. 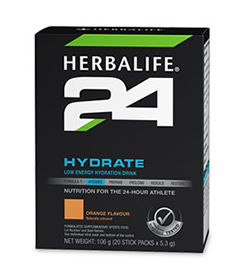 Hydrate contains 0.16mg Vitamin B1, 0.21mg B2, 0.37mcg B12 and 0.9mgB5. Dextrose, Citric Acid, Calcium Lactate, Sodium Citrate, Sea Salt, Potassium Gluconate, Natural Flavours, Magnesium Ascorbate, Dipotassium Phosphate, magnesium Oxide, Silicon Dioxide, D-Calcium Pantothenate, Thiamine Mononitrate, Pyridoxine Hydrocjloride, Cyanocobalamin, Stevia Extract (leaf).